The Z-Star Juicer is a handy mobile juicer that can be used while traveling or during power outages. It juices all types of produce well, from leafy greens and wheatgrass to soft fruit, but harder produce like large carrots may take considerable effort (see video below). 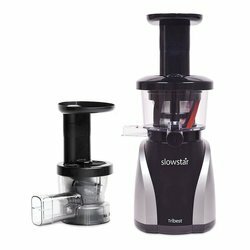 You can attach the Z-Star juicing assembly to the motor of a Tribest SoloStar I or II, Omega 8000 series, or Samson GB-9001 juicer for powered juicing, or conversely, attach the juicer assembly from those juicers to the Z-Star hand crank to have a backup manual juicer. 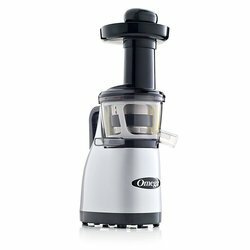 With the Z-Star Manual Juicer, Tribest makes it affordable to juice at home or on the go. Its unique single-auger design uses an extremely gentle and efficient low-RPM process to extract more high-quality juice without heating and without electric power. 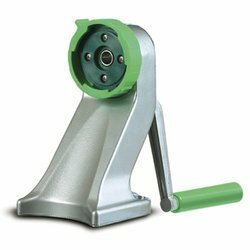 The clamp-on base attaches firmly to counters and tables for secure juicing. At 7.6 pounds, the Z-Star Juicer is lightweight, portable, versatile, and rugged, so you can enjoy fresh juice wherever you go. Comes with dispensing cup, vinyl cleaning brush, and plunger for pushing produce into feeder chute. 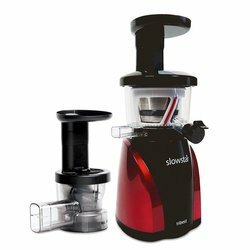 Tribest Z-Star Z-710 Manual Juicer, Free Ground Shipping (Cont. US Only) has been added successfully to your wishlist. Note: requires countertop or table to clamp on to. Counter must be no more than 2.75 inches thick and at least 2 inches deep.